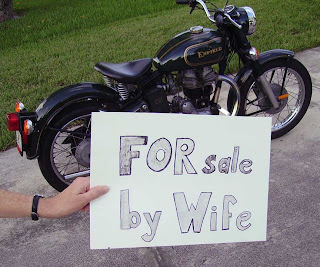 Wife want your Royal Enfield sold? I've made fun of men who run ads saying their wives are forcing them to sell their Royal Enfield motorcycle. That's just an excuse, I figured. But it turns out some wives do want the motorcycle gone — and some guys have found a way to keep their bikes anyway. "Wow! $6,200 for a bike Kelly Blue Book lists for $2,770 retail and $1,870 trade-in. The bike was $4,800 retail, new. "I had to go through the same thing. I picked up another bike and my wife said I had to sell one. So I showed her that I was trying to sell it, but no one was calling for it. ( I listed it for twice its value.) That's how I got to keep all four bikes. And if some fool wants to pay twice its value, great. If not, I get to keep all my toys. "We know the bike he's listing sold for $4,800 new. He's just not ready to part with it." Could it be that some guys could be that selfish, cowardly, conniving and low? What do you say, girls?